"It’s All Politics: Winning in a World Where Hard Work and Talent Aren’t Enough"-is the title of a book by Kathleen Kelly Reardon, PhD. Whomever I have referred this book to has found it engaging, and the title itself has drawn a lot of "yays" due to its immense relevance at the workplace. The topic is indeed interesting and important enough to garner some compelling perspectives around it. So my objective of penning these thoughts was an attempt to simplify this complex phenomenon of “workplace politics” for a working manager. 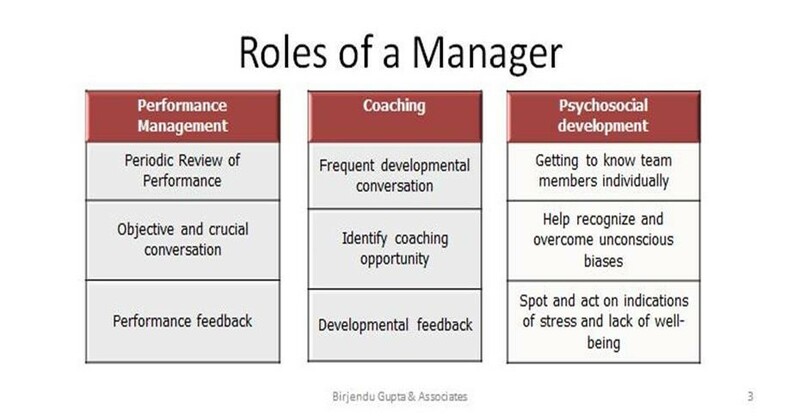 First let us deal with what are the "Roles of a manager". When I ask this question to industry practitioners in a training session they explain their job description but fail to capture what their role is. I looked up two articles on the subject, "Mentoring Millenials"- by Jeanne C. Meister and Karie Wilyerd (HBR) and "The Manager's Role as a Coach and Mentor"- by Charles, D. Orth, Harry E. Wilkinson and Robert C. Benfari, and tabulated their synopses below. It is evident that a manager has to demonstrate ability and willingness (skill and will) to deliver all the three dimensions performance management, coaching and psychosocial development. However the reality is that a working manager gets “paid” for delivering performance and getting work done. S/He cannot come to work and proclaim that he/ she is a great coach and people developer but low on delivering performance. How to get work done -The second point we will deal with is, how does a manager get his/her work done? These are a) Positional Power, b) Persuasion and c) a Combination of both. There could be many more but the most simple way to get work done is by using Power and/or Persuasion. A manager’s use of power and/or persuasion lead to a desirable outcome for him/ her. 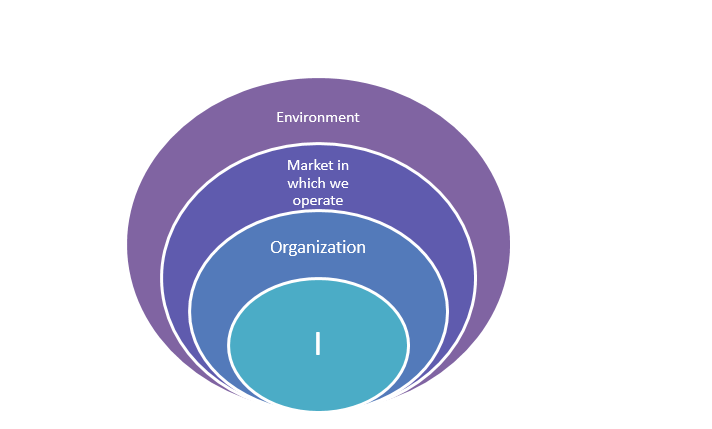 There are three types of outcomes we know of: i) resistance, ii) compliance and iii) commitment, which begs the question that does a manager, in order to excel in delivering performance or getting performance out of his her team, focus only on Performance Management and forget the other two roles? The third point I want to explore is "what outcomes does a manager want - Resistance, Compliance, or Commitment, and to understand it I would like to bring in the all important factor "Organizational Politics"
What other words do you associate with the word "Politics"
The responses indicate that all the words associated with “politics” have an underlying negative tone to them but the dictionary has defined “politics” as, “the art and science of governance”. So what makes the word give off such a negative vibe and what is its connection with what a manager wants as an outcome? This is a working manager’s playing field. At the centre is the protagonist and all the other players are in the circles expanding outwards. What flows between the actors in the frames is language. Through language a manager achieves an outcome-resistance, compliance, or commitment. Therefore the culprit that converts such a benign definition of the word “politics”, i.e., - the art and science of governance of resources, to something looked down upon as severely negative is nothing but “Language”. In the above example the intent of the manager (sender) is to get a commitment of performance from the team member (receiver). The quality, quantity and manner of communication that the sender deployed in the first situation will definitely not yield commitment. The receiver will get some compliance and more resistance. However the same sender in the second situation moderated the quality, quantity and manner of his/her communication and there is a high probability of fostering commitment from the receiver. The receiver’s perception of the sender in the first situation will not be positive and he will associate the sender with all the negative words whereas in the second situation the receiver will be given an opportunity to have a conversation. Conversation is flow of language between sender and receiver with the intended outcome of achieving commitment and if not curated well it will surely have a negative outcome. An organization’s primary purpose is to work for a common goal with limited resources. There are three resources which are perpetually on short-supply and they are MTR (Money, Time and Resources/People). Getting the job done by managing these resources is the role of a working manager. Principally politics in organizations is not different from what the dictionaries have defined Politics as the art and science of governing resources still it generates such high negative associations. The question one should ask is what could be done to overcome the negative feeling about the word Politics @work. If we can make organizational actors understand the value of politics from a different lens, the workplace will become serene like a Blue sky with endless possibilities. What to and how to … That will be for another article.